Banks have launched voice-activated consumer banking as early as 2014. The financial industry has always been very innovative with customer journeys, but people were not really using it. Until 2018, and now the question for financial institutions will be; will consumers trust voice-controlled devices to access sensitive personal financial information? 1. 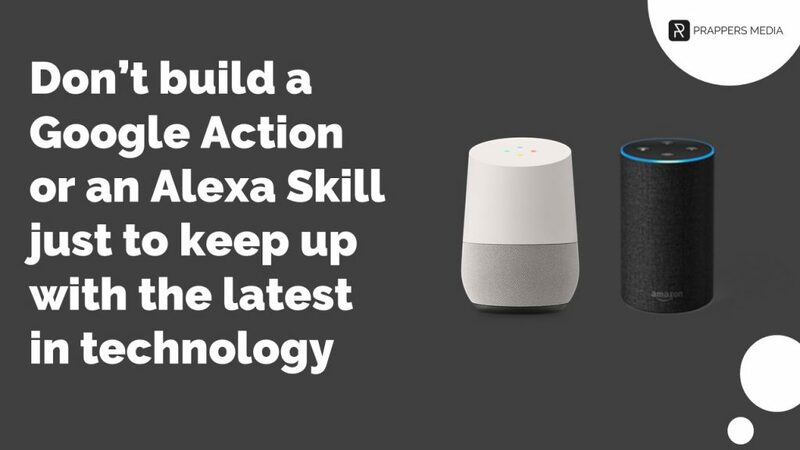 Don’t develop a voice app, Google Action or Alexa just to have one! Only build it because you understand your customer, how he/she will interact with the voice assistant. Next it should always increase efficiency and improve the customer experience. Banks should develop a clear voice strategy so they can improve their customer experiences. Some financial intstitutions already launched Alexa Skills or Google Action to check balances, hear payment dates, transactions and even make payments. Other banks integrated a voice control option into their mobile app. Voice assistants can automate any number of simple interactions, still it can’t replace phone calls about taking a loan, mortgage or an issue with an account. Voice is all about conversations and it’s a great way for banks to connect with customers. When it becomes to sensitive or complex it should switch over to a live call center agent. In an article called “A voice-led future – Banking with “Alexa” and similar services become mainstream” (read full article here) it is emphasized that technical development is crtical to put voice-led banking in place. Banks need to develop greater capabilities – or risk falling behind. Bank tactics so far have included buying solutions, partnering, acquiring a service provider, or internally developing their own software. The prevalence of personal and home assistant software on smartphones mean that banks can often find cheaper and better options by using Alexa or Siri than developing their own solution. For now, Alexa is in the lead, due in part to the popularity of Echo and other Amazon devices. Amazon has also opened its APIs, enhanced the skills of its devices, and provided developer tools. Likewise, Siri is starting to gain a foothold, with early users including PayPal, Venmo and Square. UK challenger bank Monzo, German direct bank N26, and the Royal Bank of Canada also offer payments with Siri. Google Home is evolving as well and introduced increased sophistication when it launched analysis of voice harmonics, which allows it to recognise five different voices on one device. Companies with AI-powered speech recognition that don’t yet have their own devices, such as Nuance and Personetics, are jumping into the game as partners too. Nuance powers voice-led banking in apps at banks including USAA and Santander, while Personetics powers Ally Assist. Taking a different tack, TD Bank acquired AI start-up Layer 6 AI and is collaborating with the Vector Institute for Artificial Intelligence to develop next-generation AI technologies. TD also signed an agreement with Kasisto to integrate its platform into TD’s mobile app and collaborated with Amazon to introduce voice banking using Alexa. USAA similarly bought an AI platform, Clinc, to provide human-like conversations. Clinc can extract context and intent from natural language rather than just converting speech to text and finding answers from preprogrammed responses, so the experience feels more like an intelligent human interaction, while some banks are doing the development internally. NAB Labs, for instance, developed the bank’s solution by itself.Regardless of how they develop their solution, artificial intelligence will become essential for banks to increase revenue, lower costs, reduce risk, deliver better experiences, and gain a competitive edge. Machine learning is also critical for enabling voice assistants to learn from every customer interaction, relate it to the current context and provide relevant advice. 6) Unless they develop what their customers need and quickly integrate voice services into consumers lives’, KPMG noted, retail banks could become largely invisible to consumers. Customers already trust tech companies such as Amazon more than their primary bank.